Picture and image of the exterior prehistoric megalith ruins of Santu Antine Nuraghe tower and nuragic village archaeological site, Bronze age (19-18th century BC), Torralba, Sardinia. Situated on the plain of Cabu Abbas, the Nuraghe Santu Antine is one of the most important megalithic monuments of Europe and the mediterranean. Known locally as the Kings House (So Duomo e su Re) the imposing basalt structure of Nuraghe Santu Antine can be seen from a long way off across the Cabu Abbas plain. When its Nuraghe tower was at full height of 3 stories or more then the Nuraghe Santu Antine would have been visible from miles around. 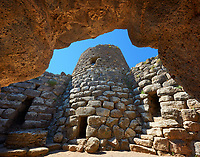 The Nuraghe Santu Antine complex has a central tower surrounded by a trilobed bastion which enclosed a central courtyard with a 20 meter deep well. From here a doorway leads into the 16th century BC tower with its single 17 meter high tower which contains one ogive vaulted chamber on top of which more chambers would have been built. From the inner courtyard another door leads to one of Nuraghe Santu Antine smaller towers which in turn leads to an internal passage that runs around the bastions of the Nuraghe. The stones used in construction by the Nuragic people were of immense sizes and are similar to the techniques found in Mycenaean walls known as cyclopic technique. The immense size of these stones allowed the Nuraghe to gain great heights making them the highest know structures of the ancient Mediterranean second only to the Pyramids at Giza. A Nuragic village of small round stone houses surrounded Santu Antine Nuraghe and to date 14 houses have been excavated. 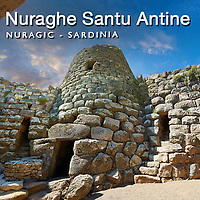 Download pictures & images of Santu Antine Nuraghe on line as stock photos or buy as photo art prints on line.